The theory of capital structure that we have outlined is called the static theory of capital structure. It says that firms borrow up to the point where the tax benefit from an extra dollar in debt is exactly equal to the cost that comes from the increased probability of financial distress. We call this the static theory because it assumes that the firm is fixed in terms of its assets and operations and it only considers possible changes in the debt-equity ratio. fected by its capital structure. The second case, M&M Proposition I with corporate taxes, is represented by the upward-sloping straight line. These two cases are exactly the same as the ones we previously illustrated in Figure 17.4. 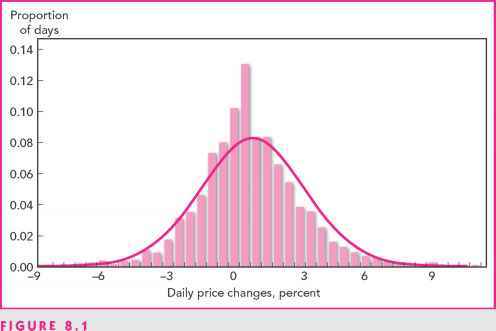 The third case in Figure 17.6 illustrates our current discussion: the value of the firm rises to a maximum and then declines beyond that point. This is the picture that we get from our static theory. The maximum value of the firm, VL*, is reached at D*, so this point represents the optimal amount of borrowing. 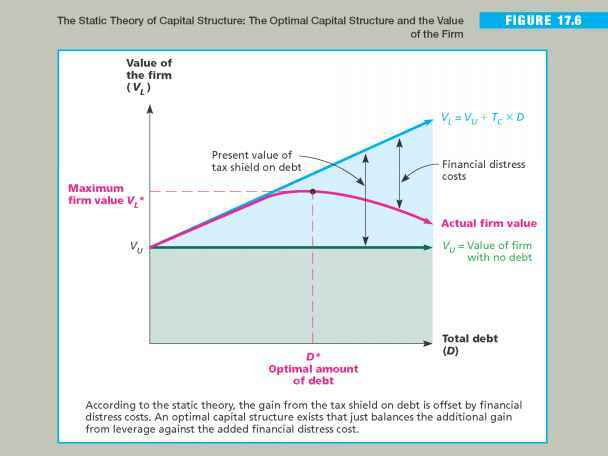 Put another way, the firm's optimal capital structure is composed of D*/VL* in debt and (1 - D*/VL*) in equity. The final thing to notice in Figure 17.6 is that the difference between the value of the firm in our static theory and the M&M value of the firm with taxes is the loss in value from the possibility of financial distress. Also, the difference between the static theory value of the firm and the M&M value with no taxes is the gain from leverage, net of distress costs.